I heard about an intriguing technique while I was at the Glasgow School of Yarn - 'Navajo Knitting'. No, it's not a traditional Native American knitting technique - it takes its name from Navajo plying, or chain plying, in spinning. I've done Navajo plying many times before - it's an extremely useful technique to preserve color changes in handspun yarn, and to make a 3-ply out of one strand of singles. In a nutshell, you make a very long crochet chain out of your singles, and then twist that into yarn. Navajo knitting is the same principle, only without the plying twist. You take your single strand of yarn, and start making it into a long (as long as you like - an arm's length of more) loop, and pull the yarn through the loop, as if it were a giant crochet chain. It takes some getting used to, but it's very effective once you've got it. The technique was first 'discovered' or 'unvented' by Lucy Neatby, and you can see her video on it here. Why use Navajo knitting? It's the perfect way to knit with a yarn tripled. It's easy to knit yarn doubled - just knit from both ends of a center-pull ball. But to knit with yarn triple, you'd need either three balls of yarn, or a center-pull plus an extra ball. With this technique, you can easily knit with three strands of yarn out of only one ball. I tried it out on some laceweight swiss silk I got from The Yarn Yard booth as GSoY, for my hexipuff blanket. It worked a treat! See the loop at the end of the yarn? 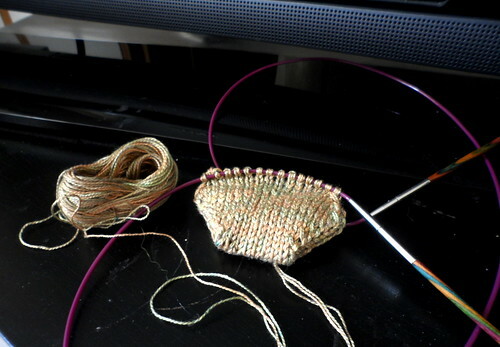 The silk is far too thin to be knit on its own into puffs, and it's a bit thin even when doubled. But tripled, it's just the right weight.